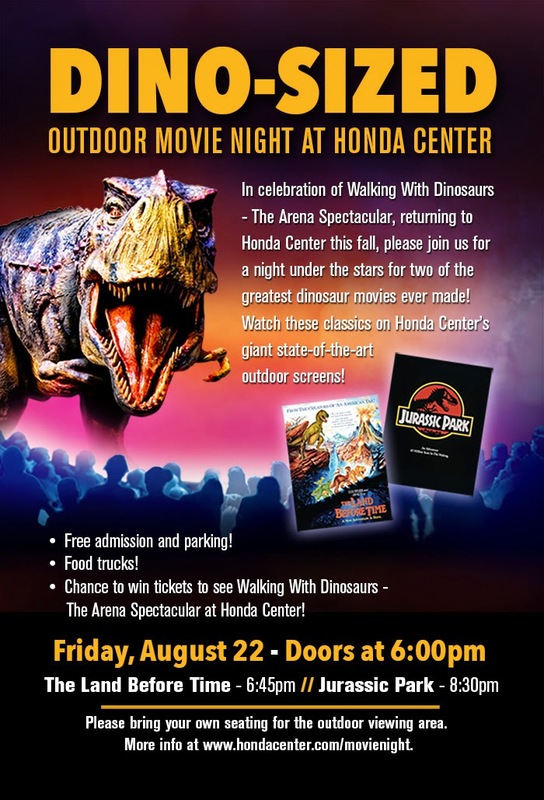 This Friday, August 22nd, the Honda Center will be showing a an outdoor double-feature, The Land Before Time at 6:45 p.m. and Jurassic Park at 8:30 p.m. Admission and parking is free and there will be food trucks - as Dogzilla, The Grilled Cheese Truck, Ms. Kettle, Kona Ice, and Drive Me Cookie - offering perfect movie night menu items complete with hot dogs, grilled cheese sandwiches, popcorn, ice pops and cookies. At then end of each movie, there will be a chance for attendees to win tickets to Walking With Dinosaurs -The Arena Spectacular at Honda Center, September 3 -7th.